These superyacht outdoor cinemas think outside the box, literally getting outside and putting the yachts' exterior design elements to good use for movie viewing al fresco. 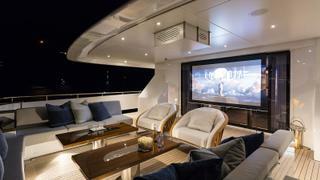 Laurentia's interior designer Radyca is particularly proud of her aft deck cinema - and for good reason. The retractable HD projector is fitted right above the sliding doors leading to the main saloon and is double-sided meaning guests can watch movies from both the saloon and the aft deck at the same time. The screen is treated with special 360-degree projection technology - which can be applied to both vinyl and glass - meaning films can be projected onto both sides simultaneously using just one projector equating to an impressively high-tech space-saving solution. Available to charter with Burgess, step on board the 55 metre Heesen Laurentia in the July 2018 issue of Boat International. 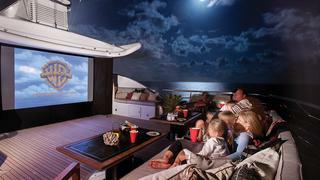 These superyacht outdoor cinemas think outside the box, literally getting outside and putting the yachts' exterior design elements to good use for movie viewing al fresco. 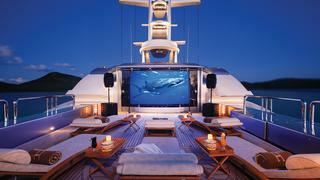 Laurentia's interior designer Radyca is particularly proud of her aft deck cinema - and for good reason. 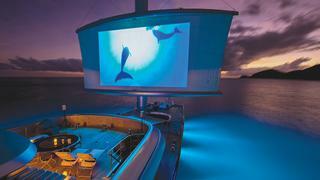 The retractable HD projector is fitted right above the sliding doors leading to the main saloon and is double-sided meaning guests can watch movies from both the saloon and the aft deck at the same time. The screen is treated with special 360-degree projection technology - which can be applied to both vinyl and glass - meaning films can be projected onto both sides simultaneously using just one projector equating to an impressively high-tech space-saving solution. Available to charter with Burgess, step on board the 55 metre HeesenLaurentia in the July 2018 issue of Boat International. The 44 metre Heesen superyacht Jems is packed with state-of-the-art audio visual equipment, but the star of the show is surely its outdoor cinema. 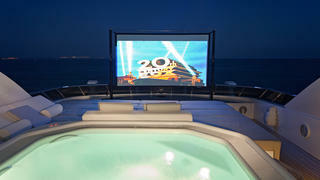 Situated on the sundeck, this removable screen allows guests to enjoy a movie from the bubbly comfort of the superyacht spa pool. Jems boasts a maximum cruising range of 1,000 nautical miles, ideal for exploring the stunning coastlines of the Western Mediterranean. 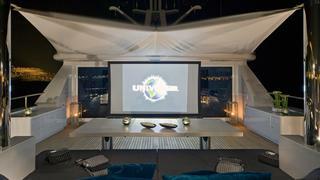 The iconic Perini Navi sailing yacht Maltese Falcon boasts the largest outdoor movie screen on the water. How? Films are projected onto her sails. This unusual outdoor cinema beats any indoor theatre experience hands down, experience it for yourself by chartering Maltese Falcon with Burgess. Sit back on a luxurious chaise lounge on the expansive sundeck on Solemar and get a magnificent view of the three-metre custom outdoor cinema screen with HD projector. A true movie under the stars! A large plasma screen can be lowered from the aft deck overhead on Turquoise, available to charter with Thompson, Westwood and White, creating a Nikki Beach-style outdoor cinema fitting of a superyacht. Cozy up on the couch in front of the big screen on charter yacht Turquoise. 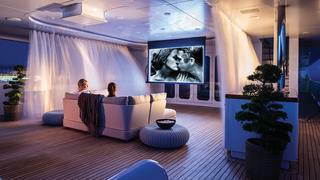 Join in the family fun watching movies together on Amels yacht Belle Aimee's outdoor cinema, found on her top deck. Sit on the comfy sunpads in front of the large projector screen and keep snacks handy on the tables in front of you. With an impressive drop-down screen, a state-of-the-art entertainment system and an extensive on board movie library, films are featured at their finest on superyacht Cyan's outdoor cinema. Charter her with Burgess this season. Set the scene under an open-air Bedouin tent on 54.3 metre Alloy sailing yacht Tiara, which is currently for sale with Y.CO. 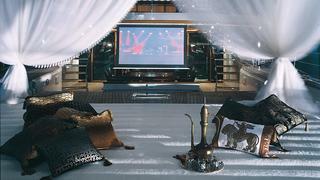 A large retractable TV screen and cushions make this al fresco cinema a real Arabian delight. Just try not to fall asleep surrounded by the cool ocean breeze.